Q(i).Why do the plates move? Answer.The plates move due to endogenic forces in the interior of the earth. Q(ii).What are exogenic and endogenic forces? Answer.The forces that act in the interior of the earth are called endogenic forces. The forces that act on the earth’s surface are called exogenic forces. Answer. Erosion is the wearing away of the landscape by different agents like water, wind and ice. Q(iv).How are flood plains formed? Answer. When rivers outflow their banks, they cause flood in the neighbouring areas. The flood water takes away fine soil an other material and deposit them along the banks. This deposition leads to the formation of flood plains. Q(v) What are sand dunes? Answer.Winds lift an carry sand from one place to another.When they stop blowing,sand falls and gets deposited in low hill-like structures called sand dunes. Q(vi). What are ox-bow lakes? Q(i) Which is not an erosional feature of sea waves? (a) Cliff. (b) Beach. (c)Sea cave. 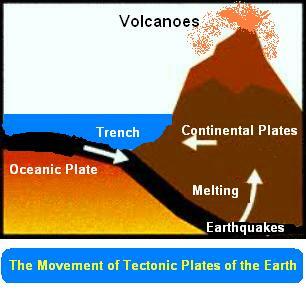 Q(iii) Which is caused by the sudden movement of the earth? (a) Volcano. (b) Folding. (c) Flood plain. (a) Deserts. (b) River valleys. (c) Glaciers. (a) Glaciers. (b) River valleys. (c) Deserts. 1 Glacier . (a) Sea-shore. 2 Meanders. (b) River of ice. 4 Sand dunes. (d) Vibrations of earth. 5 Waterfall. (e) Hard bed rock. 1 Glacier . (b) River of ice. 2 Meanders. (c) River . 4 Sand dunes. (f) Deserts. 6 Earthquake. (d) Vibrations of earth.